Less than two weeks before the centenary of suffragette Emily Davison, The Regent’s School Pattaya hosted the first screening in Thailand outside Bangkok of a new documentary film, Girl Rising, on Friday 24 May. A large audience came together to support the film which depicts the necessity of girls’ rights to education worldwide. The film was shown in the school’s Globe Theatre which housed over 300 personally invited guests. The event was organized by a group of students that make up the Girl Up group, a global campaign supported by the United Nations Foundation that unites over 300,000 students worldwide. 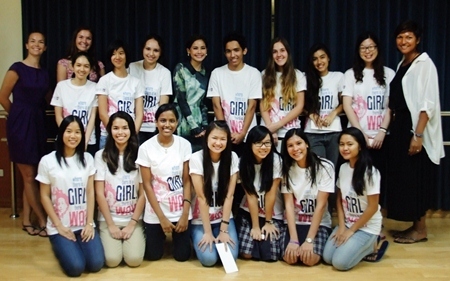 They welcomed members of the community, community partners and even Thai soap star, Yaya Urassaya Sperbund. Yaya introduces the film Girl Rising. Directed by Oscar-nominee Richard Robbins, Girl Rising tells the story of nine young girls from nine different countries whose lives have been changed by the power of education. Commenting on the night, members of the audience agreed that the subject of the film was inspirational and highlighted the necessity for change. Yaya Sperbund, returning for the first time as an alumnus of the school, explained the importance of a correct mindset. Several members of the Girl Up group agreed that it reinstated their reasons for taking part in the global campaign in the first place and saw their mission becoming clearer. The only male member of the club, Haroon Wahidi from Afghanistan, expressed how he knows all too well what the girls in the film are going through. Bronwyn Carey and Kylie Grimmer from Women With a Mission, a Pattaya-based charity dedicated to improving the lives of children living along the Thailand/Myanmar border and families in the region of Chonburi, Thailand, both left with the intention to organize a screening themselves to spread the message even further. Yaya (centre) with the Regents’ Girl Up group. Notes: The Girl Up Group is a branch of larger campaign of the United Nations Foundation and was adopted by the school in 2013. Their slogan is ‘Uniting Girls to Change the World’ and currently consists of over 300,000 members from across the globe. Women with a Mission is a charity dedicated to improving the lives of children living along the Thailand/Myanmar border and families in the region of Chonburi, Thailand. Yaya Urassaya Sperbund was a student at The Regent’s School Pattaya from 1998 to 2009. She was one of the first students in the then very young school and saw it go through its early growing stages. It was at The Regent’s School Pattaya that she first studied drama.